When the Surface Book launched, it offered a lot of innovative ideas in the laptop space, and none more innovative than separating the CPU, RAM, and storage into the display section, which is removable, and the GPU and majority of the battery into the base. It allowed Microsoft to pack in more battery than most other laptops at the time. 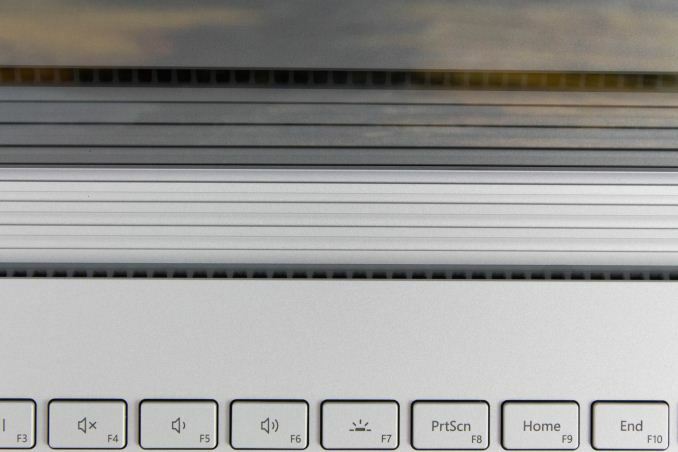 To avoid the usual top-heavy feel of most laptops with a detachable display, Microsoft created an interesting hinge design, which rolls out when opening the display, making the base slightly longer and giving it more leverage. That hinge has returned, and keeps the Surface Book 2 looking like a Surface Book. Not everyone loved the hinge design, but it does work well and gives the Surface Book lineup a design touch that is instantly recognizable. The hinge doesn’t let the display lay flat, but it has to balance the weight of the display versus the requirements of opening the display all the way, which is somewhat negated by being able to detach the display if necessary. The tablet section is not something you could use as a tablet full-time. At 15-inches in size, it’s a bit unwieldy, which was already an issue with the smaller 13.5-inch model. The squared off edges look great, but don’t help much with in-hand feel of the large tablet. With the relatively small battery capacity, the overall weight of the tablet is light enough that it’s easy to use in short bursts, but short bursts are all you’ll get out of it anyway before the battery needs to be replenished. Just like the original, it offers a satisfying “kerchunk” when detaching from the base. The base is almost a carbon-copy of the Surface Book with Performance Base mid-cycle upgrade model. The keyboard is slightly raised to give more room for the GPU and cooling components under it. Other than the USB-C port, the new base looks identical to the older version, keeping the two USB-A ports on the left, along with the SD card reader, and offering the Surface Connect port and USB-C on the right. 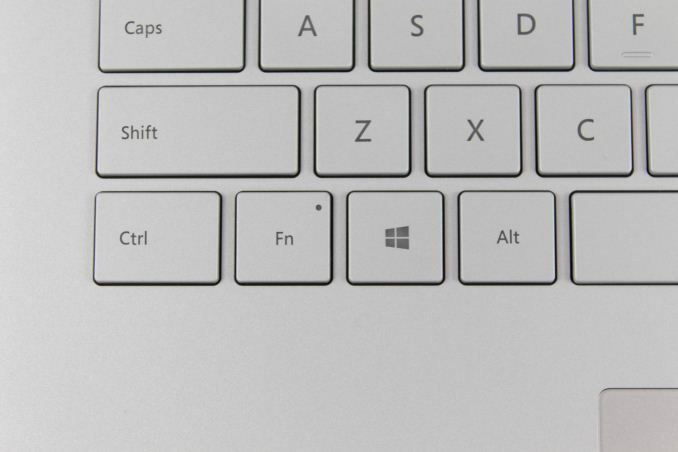 The keyboard on the original Surface Book was one of the better models available on a laptop, offering good travel, and good key feel. Luckily it hasn’t really changed, and still offers three levels of white backlighting, and thanks to the gray color of the keys, the white backlighting still offers decent contrast even when in a bright environment. 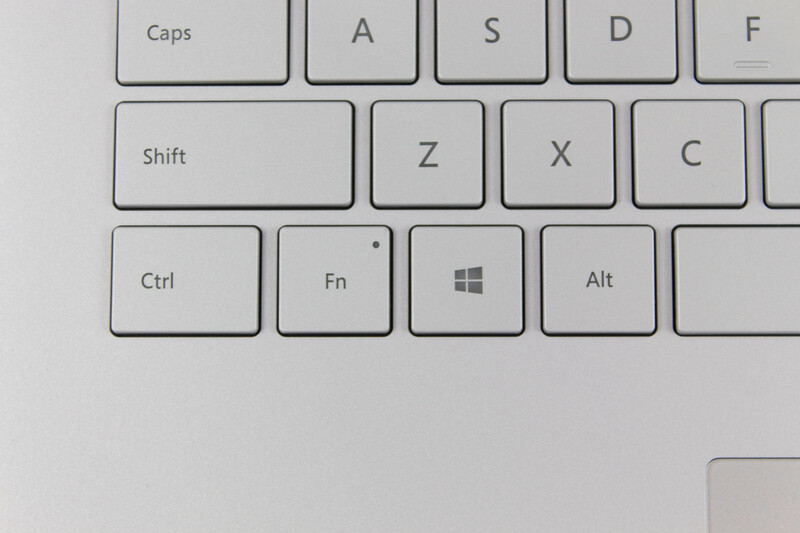 Microsoft offered the best trackpad experience on a Windows PC with the original Surface Book, and that great precision and feel of the glass trackpad carries over with the new model. The trackpad is large, but without being too large, and the latest Precision touchpad software offers plenty of customization for gestures and more. It’s wonderful to use, and makes you miss it when using an inferior device. Microsoft’s gray magnesium design has become something they are known for, even if not all of the devices are magnesium anymore, but on the Surface Book 2, the texture and feel of the material is as premium as any device on the market. 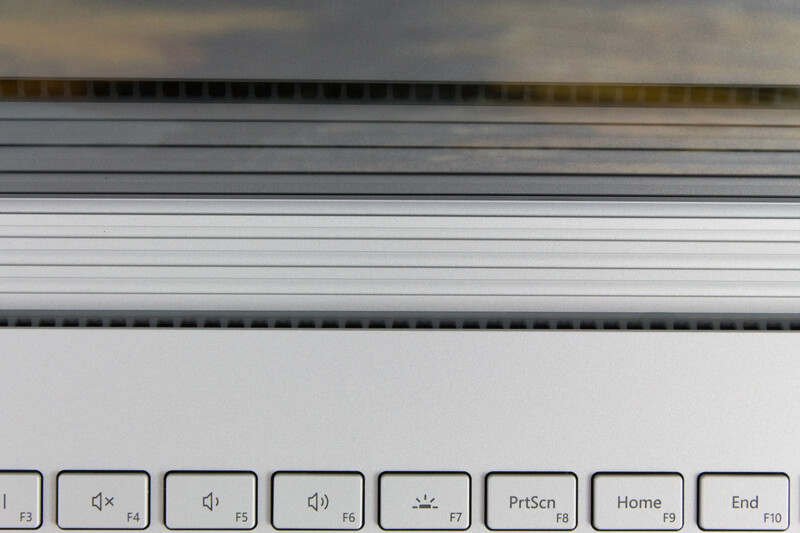 The chassis has a chamfered edge in front of the trackpad to allow you to open it easier, and although the rest of the edges are more acute, they still have a slightly rounded corner to prevent sharp pressure on your wrists when typing. Thanks to the 3:2 aspect ratio of the display, the Surface Book lineup also offers more wrist rest area than most other notebooks. Overall the design of the Surface Book 2 is fantastic, which is becoming an expectation when dealing with the PC products from Redmond. The only small thing to point out would be the location of the headphone jack, which is on the top right corner of the display, making for a somewhat awkward cable arrangement when using wired headphones. It would be nice to see a second jack in the base, to be used while the laptop is being used as a laptop, but that seems like a small thing to complain about on an otherwise very well designed and built device. In my opinion "fanboy" is typically a term that is on tech website often in an attempt to discredit someone who has different - this I found mostly used by people that like AMD products and hate Intel. Most Intel people pretty much ignore technical sites - except if they are gamers. I am not an Intel "Fanboy" but I do support Intel - and why is simple, I have a long history of using there products and for graphics had a bad history with Ati GPU's - which is now part of AMD. i also believe that when a company creates a product you should buy from one's that created it. But things to change - I used to pro-Microsoft almost Fanboy and refused used Android, but I have great success with Samsung Tab S series ( both an S and now S3 ) and I also have Surface like Samsung TabPro S series. Odd that your issue with AMD would be due to technical experience. I worked on the Windows kernel for a number of years and during that time AMD developed both the Athlon and Athlon64/Opteron line. It was the technical perspective that brought me and so many other engineers towards AMD, they understood good architecture while Intel understood good marketing. Dave Cutler famously embraced AMD64 when it became clear to him what a mess IA64 was. That isn't to besmirch Intel as an engineering company. They got religion when Netburst hit its wall at only 40% of its design specification. But for Intel the limiting factor has long been marketing and management, for AMD it has always been resources. The latter reasons I respect a lot more than the former. I've pointed this out repeatedly, but TB support is a non-starter for a corporate focused laptop. It is considered a security risk as it is a direct line to the PCIe bus and can be used to easily bypass Bitlocker and other security measures. Devices with TB on them are almost never permitted for government or sensitive corporate sales. There also really isn't much demand, while I'd like to see more USB-C if only for future compatibility, to date only my phone actually uses it (and most connectors use standard USB on the other end) and eGPU or external storage simply aren't rational for a system based on a 15W CPU. The available 1060 already is bottlenecked by that CPU so I'm not certain what an eGPU would gain you (or really fast storage vs just having it on the network). Then make the functions switchable in the BIOS.